Yeehaw! Win big when you play Wild Wild West: The Great Train Heist Slots! It has a comic book style, exciting bonuses & more! Do you have what it takes? 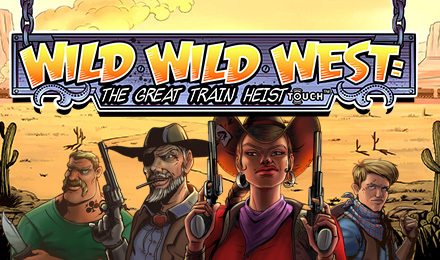 Wild Wild West: The Great Train Heist Slots is a guaranteed fun time and promises an adventure of a lifetime! There are 5 reels and 10 paylines, a generous 96.75% RTP and loads of bonuses and wins! You’ll see 4 different Wilds, such as a Spreading Wild, Expanding Wild, Multiplier Wild and a standard Wild. Plus, there are FREE Spins up for grabs and a Pick and Click Bonus with up to 50x multiplied wins!